Yes, I’m still talking about the Rijksmuseum. The Rijksmuseum has good information. They’ve got a free audioguide app for your phone (and free wifi in the museum for downloading it), or you can get a physical guide there if you’ve forgotten your headphones or whatever. There are also placards hanging alongside the artwork with information (not just the name or the work and artist). And then, as a third option, in case you didn’t have enough, they have large laminated sheets (like 11x17s, except whatever size is equivalent in Europe) with details about the most famous works in the room—pointing out the minutia you might otherwise miss. 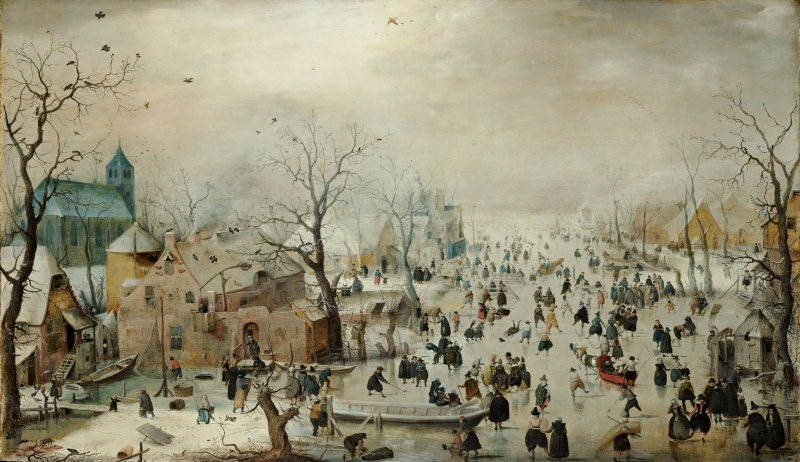 So, the Winter Landscape with Ice Skaters by Hendrick Avercamp. What did the Rijksmuseum think was one of the most important aspects of this work to focus on?